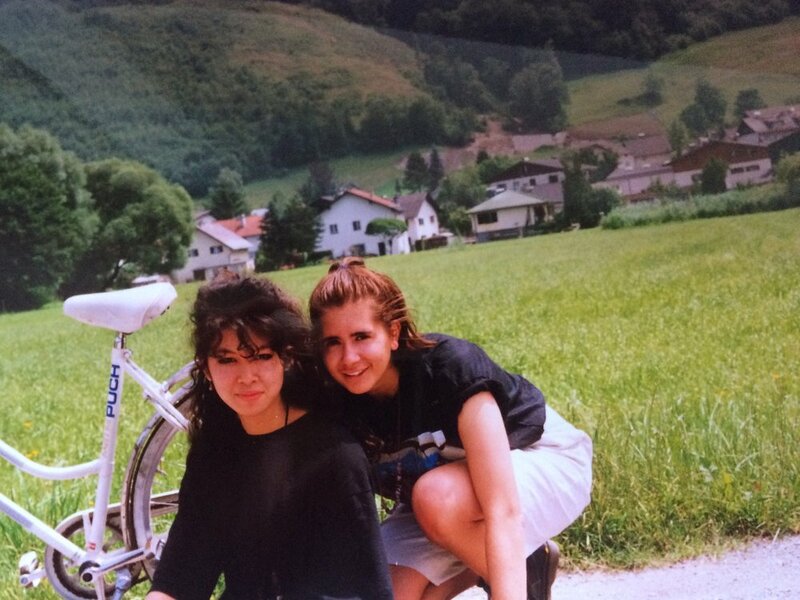 Jen and me in Austria - 1991! Last time I was in Vienna I was seventeen, and inter-railing with my old mate Jenny. It was a Saturday morning, we had heavy rucksacks and tie-dye t-shirts. Stepping into what my memory tells me was a rather stuffy-feeling European city on a grand scale, we decided not to hang around, and got on the next train to Salzburg. Now a little older, and with various references to Vienna presenting themselves to me over the past few years, I decided to give the city another go. 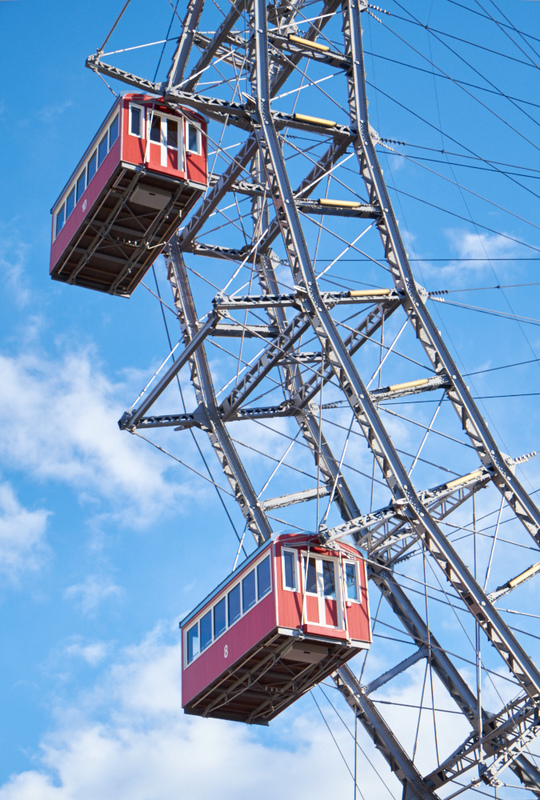 I got out at Praterstern as my host suggested, and could see the famous Ferris Wheel of Prater Park straight ahead. Despite a strong, cold wind, there was a bright blue sky, which was ripe for picture-taking, so I pulled out my camera and got snapping. After half an hour or so taking pictures, negotiating my suitcase in the bitter wind got the better of me. I knew my accommodation was walkable from here, so I headed back to the station to get my bearings. This proved harder than expected, so I asked a Police Officer for help. It turned out, he had the map the wrong way around when sending me on my way! Whilst bumbling around I received a message from the Airbnb guy asking if I knew my ETA, to which I responded "I'm a little lost". That was just seconds before my phone died, so I couldn't ask for his help. Oh well! It all worked out in the end. Andrijj my host was making a salad when I arrived. From the profile I'd read, and the organic kale toothpaste I saw in the bathroom, I had him down as having a super-clean lifestyle, so was a bit surprised when he offered me a glass of wine at three in the afternoon. Redemption! We had a quick chat about the local area and routes to the city's hotspots. He suggested I get my bearings by heading to Das Loft, a restaurant/bar on the 18th floor of Hotel Sofitel. I got waylaid enroute, as I was struck by a painting in a gallery window. The gallery was of artist Andreas Reimann, and his collage work looked somewhat familiar. I stepped inside, and was greeted by the gallery assistant with a shout from the back of the space. She came through and talked me through his work, and some of it's history. Not at all stuffy, and very open to conversation. That was a nice start. Just ten minutes walk from my accommodation, the bar at Sofitel offers stunning views across the city to the mountains behind. I arrived just in time to see the sun go down below a dramatic sky. Nice! Late-lunchers were filtered out by people coming straight from work as it was Friday, and then came the well-heeled who were out to dine. I could have stayed there all night people watching, but I felt there was more to be discovered and I had Schnitzel on my mind. I have the most terrible habit of having an idea and then doing anything in my power, and outside it seems to turn that idea into a reality. It cuts both ways - on this particular evening it resulted in another wild goose chase. I had pretty much arrived at the street Wieden Brau was located, in a quiet area of the city. It was a dead-looking street full of office blocks, so I decided to ask a local. With impeccable English (I can never decide if this makes us Brits very fortunate or bloody ridiculous, but nevertheless it was very welcome). This lady got her phone out and started looking at the map, saying she was terrible at map-reading, but agreeing we must be within sniffing distance. Alas, I thanked her, and with more determination went around the block to enter the road from another angle, and turning right I could see the flicker of a light. I had reached my destination. Greeted by a super-smiley waiter I got myself a home-brewed beer and ordered a Viennese Schnitzel. A plateful of hammered pork in breadcrumbs arrived, with a side-dish of potato salad. After another home-brew and a day of travelling and walking, it was time to turn it in. I had the best sleep I'd had in ages. With a lazy start to Saturday, I headed out in search of food. I read the menu outside a popular-looking cafe/restaurant, but decided it looked a bit formal - the Austrians are still quite partial to Velour dining seats and fully dressed tables. I walked on just a few paces and glimpsed through the door of a bustling cafe whose atmosphere lured me in. Asking if they had room for one, I was seated on a large table surrounded by couples, friends and families. I settled in and felt more comfortable than expected, as the table was big enough not to have to stare directly at the people opposite, so comfortable in fact I decided that nobody knew me and I dared to take a few pictures as discreetly as possible with my camera on the table. Two women entered the restaurant - old and glamorous; the kind that stand out. They didn't seem amused that they may have to share a table with the riff-raff (well, riff-raff might account for me, and one other, as Vienna seems to be a smartly dressed city on the whole). Anyway, it took them no time to settle in and ask the couple next to them what they were eating. It turned out that Le Bol was a French restaurant, and I opted for a continental breakfast which I think was the best I've ever had - A perfectly boiled egg, Brie at precisely the right consistency, tasty meat and a wide selection of breads. The only thing I was having trouble ordering was the right kind of coffee. I ended up with a Cafe Noisette, which was nice, but about a quarter of the size of my regular caffeine fix. It took me until my third day to master my coffee ordering - I was at a cafe near the Belvedere grabbing a quick bite before heading to a Museum. An elderly lady came and sat near me, and she had the kind of coffee I wanted. So, in my best German I asked her how to ask for that type of coffee. She responded in English and asked if I had some paper, then dutifully explained the various coffees and their names and insisted on writing them down for me. If you should find yourself in Vienna, and in need of a regular coffee, ask for a Verlangater, braun with milk, Schwarz without. You're welcome! I headed to the Leopold Museum which took an age, as prior to leaving the UK, many people had told me how Vienna was a walkable city. I subsequently spent the first day and a half walking miles, whilst getting disorientated regularly, and opted for public transport for the following day and a half. The second option was preferable! Stylised Flowers on Decorative background, Egon Schiele. 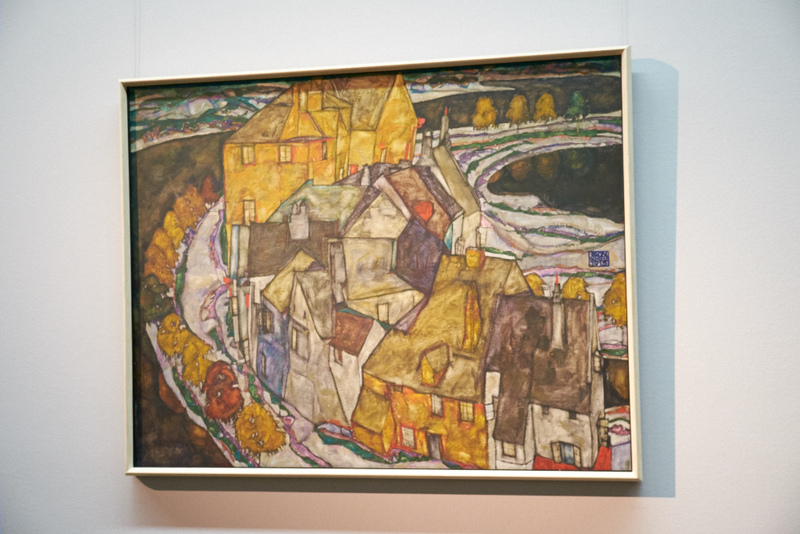 Schiele regularly visited the city of Krumau in Southern Bohemia (today Cesky Krumlov in the Czech Republic) to make his own interpretations of the buildings there. I liked the wistful nature of the paintings. Gathering my thoughts in the Gallery cafe I made plans for the evening, and opted for a trip to Porgy and Bess - a famous Music & Jazz venue. By the time I arrived it was standing-room only, so I headed upstairs where I tried several positions to allow a view of the stage. It was my opportunity to try Austria's famed wine of Gruner Veltliner, so I ordered a small Caraffe and perched myself near a shelf as the people below settled in for the evening. The lady who served me was very friendly and chatty. When I returned to the bar later she asked if I had a seat. Giving her my answer she went out the back and presented me with a stool and said I could take it wherever I liked. This was much appreciated after a day walking the streets! I was entertained by Harry Sokal and Depart featuring Jean - Paul Bourelly. I enjoyed the Jazz, but on the whole I find an hour of Jazz is all I need as it never quite lifts far enough off the ground for me, musically speaking. Another lazy morning planning for the day ahead, and it was time to tick a further venue off the list. It was a rather miserable day with sleet in the air, so I wrapped up and headed to the Belvedere, one of two Palaces built in the early eighteenth century as the summer residence of Prince Eugene of Savoy (1663-1736). According to sources more knowledgable than I. 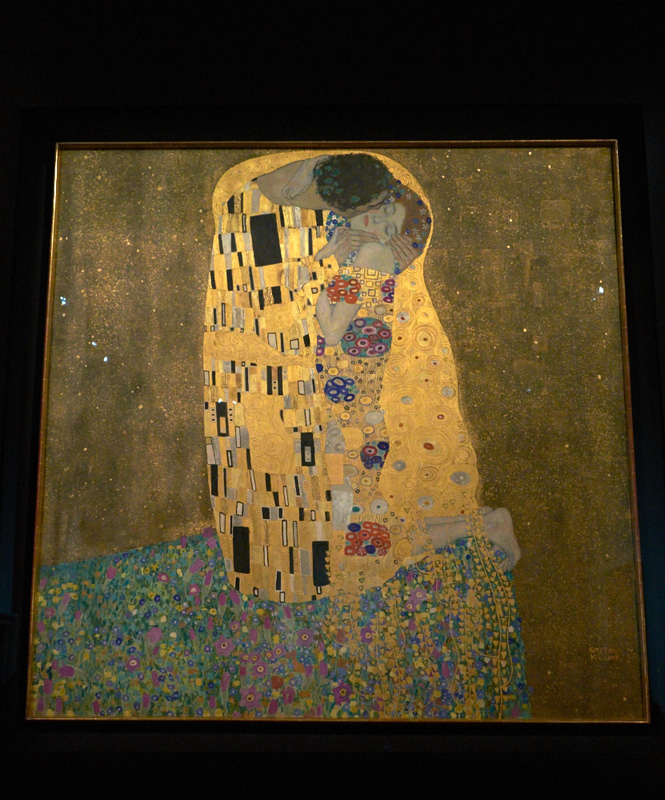 The Belvedere hosts one of the most famous paintings on the planet - Gustav Klimt's The Kiss. I had a three foot squared version of this painting on my wall for years (we're soon to be reunited) so I was excited to see the real thing. In between waves of guided tour groups and people taking selfies as they kissed before this glistening masterpiece, I was able to get a clear look and absorb the beauty of the painting. 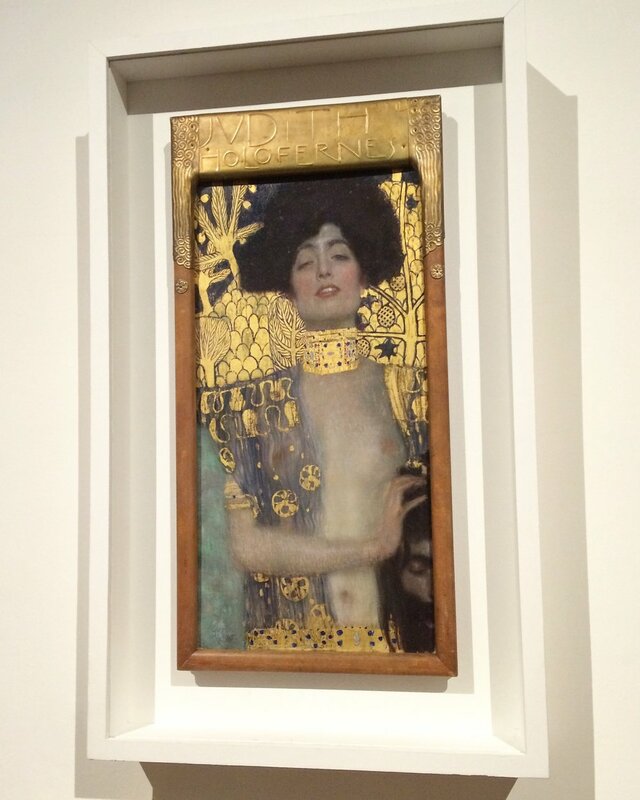 This iconic image was positioned at one end of a large room bedecked with Klimt's work, but I need to rewind to tell you what really blew my mind that day...I had walked along the large corridor of the first-floor gallery, which presented joy after joy, mainly through the work of Klimt and Schiele. I entered the large room at the end, not knowing what was inside and was immediately arrested by the sight of Judith 1, depicting Judith and Holofernes . It's radiance jumped out at me, and I may sound like I'm exaggerating, but I was truly stunned - everything about it: the rapturous look on her face, the glow of the paint, the fact that at the edge of the painting a man's head was somewhat in her grasp. There were a couple next to me, and the wife was explaining the story of Judith and Holofernes to her husband. I took a seat on a bench, to admire the painting more, and to do some research on this myth: depicting a story from the Bible, Judith was a Jewish patriotic hero. She seduced and decapitated General Holofernes in order to save her home town Bethulia from the Assyrian army. I rushed back home to get spruced up for this evening's entertainment. Vienna is renowned for it's classical music and it happened to be 'Ball Season' whilst I was in town. For a lot of these events you need to wear a full-length evening dress, men an evening suit. I wasn't up for that, so opted for a Strauss and Mozart evening at the Wiener Kursalon. Set in a large hall with a raised stage, and outnumbered twenty-to-one with Japanese tourists it was an entertaining evening, consisting of a small orchestra, two opera singers and a couple of Ballerinas. There was a heavy-set lady wielding a 'No Photography' sign above her head for half the performances, but all she did was pull disagreeable faces when she was ignored by several audience members! I think the tickets were over-priced, but I was a tourist with limited time, and sometimes you just gotta try these things. And, so before I knew it, it was my last day in Vienna. I still had a few things to do: one was to track down Cafe Sperl. 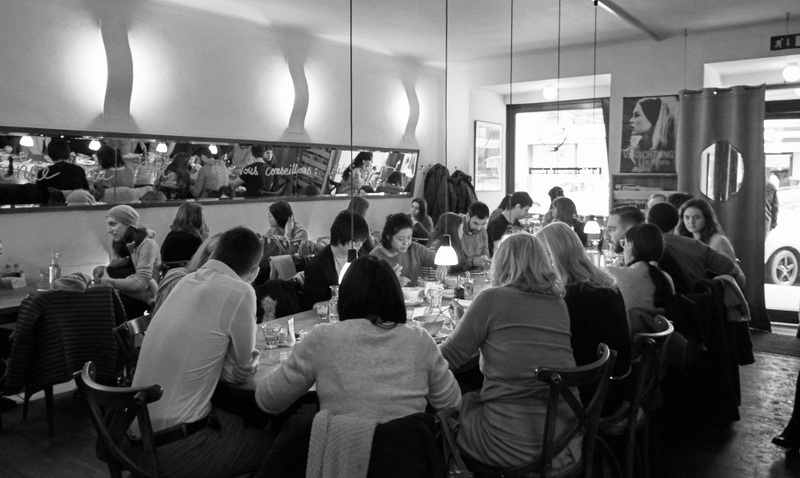 Built in 1880, Cafe Sperl has been a hotspot for creatives and writers over the years. I felt compelled! My last post, apart from the Naschmarkt which I had a quick scurry through (don't think winter is the best time for a visit) was the Musik Verein. Some years ago, and I don't know how, I found myself watching the New Year's concert in the early hours on the BBC, which has been televised most years from 1989. I remember being impressed by the Viennese Waltzes - both the music and the ballerinas. If you go to the event itself, you would only see the Orchestra, as the ballerinas perform simultaneously in other parts of the city. To get tickets for the event there is a lottery system, where people apply in the same way we did for the Olympics in 2012. Prices range from £100 to £1000. I might try some day! I joined a guided tour (the only way) and was delighted by the enthusiastic guide and his description of the construction of the large concert hall. He quizzed the audience and told us of, how many of the structures within were not as they seemed - fake marble, a suspended roof for instance, much of which is done to improve the acoustics. It was yours truly who guessed the last remaining 'fake in the room' which was the Organ. What we see is a Facade, but behind is the real thing - easier to manage repairs that way apparently without disrupting the whole structure. There were strictly no photos, but with a deft hand I snapped a quick ceiling shot on my phone, before some of my fellow tourists got a telling off - it pays to be a Pro! On my little jaunt, I managed to tick everything, but two items off my itinerary and it didn't matter as the Secession House had scaffolding on and the Butterfly house at the Hofburg Palace was closed for refurbishment. As I've said before, you cannot get a sense of a place in a short visit, and everywhere has it's flaws (one friend commented on the rise of the far right in Austria, but I didn't get the air of deep conservatism in my time here). There was something nice about feeling like you'd stepped back, just slightly, in time. It got me thinking of Chairman Mao's 'great leap forward'. Too many times, in my opinion, we rush ahead blind, making unnecessary changes to customs, that upon reflection do add something special to the cohesion of a place - and I don't think it has to mean the heart stops beating, just, maybe with a calmer rhythm. My host is certainly at the forefront of technology, with 8 hard-drives/expansion cards whirring away in his living room, some form of Bitcoin miner. He was singing the praises of this city (he is from Croatia) and told me that Vienna has won the award for best city in the world to live in for ten years running. In conclusion, I would thoroughly recommend Vienna for convenience, art, and relaxation. My only gripe was there were too many men in Cardigans. *I visited Vienna from 19-22 January 2018. *all Umlauts are missing, apologies!